Anze Kopitar (L) and Justin Williams practice in preparation for the Stadium Series game against the Ducks at Dodger Stadium. LOS ANGELES — Just hours after a tense Freeway Faceoff battle in Anaheim, the Kings and the Ducks took to the outdoor ice for the first time Friday afternoon in preparation for Saturday’s Stadium Series game at Dodger Stadium. Here’s how the Kings are feeling following the first practice at Chavez Ravine. The Kings got back to work after a 2-1 loss, and while Dodger Stadium might not come even close to the Toyota Sports Center, practice was business as usual. All of the fanfare surrounding the game doesn’t change the fact that two points are on are on the line in Saturday’s game. "Both teams need the points," said defenseman Matt Greene. "It’s an outdoor game but at the same time it has the same ramifications." The Kings have lost four straight and trail the Ducks by 17 points in the Pacific Division. Special teams has been the biggest struggle and it was no different against their league-leading rivals, as they gave up a power-play goal and failed to score any of their own. "When you’re struggling to win games, like we are right now … I’m not going to say you have to play a perfect game but you have to strive to play a perfect game," said defenseman Robyn Regehr. "You look at special teams, we gave up a power play goal to give the Ducks the momentum. And I think with that being said, the power play could be a little bit better, it could be sharper to create some momentum for us." The word of the day was "hollow." The ice had a hollow sound, thus ushering in discussions of the hollows on each players’ skates. While not perfect, the consensus amongst the Los Angeles locker room seems to be that it’s still pretty good given the humid, 70-degree weather. "Obviously, once we got to skate on it a little more it got a little more chewed up," said winger Trevor Lewis. "But it was better than I expected it to be." 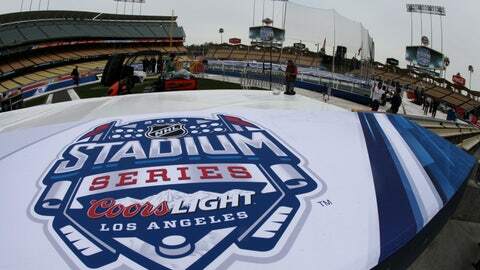 "It’s probably the best outdoor sheet of ice in Southern California because it’s probably the only one," Regehr said. "But it will be fine. It will be the same for both teams." For some that played baseball, being in Dodger Stadium brought back memories of old dreams. "It’s fun coming out of the dugout like that," Greene said. "Like every kid who played little league and stuff like that, you get a little bit of a dream. And to do it with the gear on, obviously not the right kind, but it was a pretty cool experience." But for many, being on outdoor ice — weather aside — brought back some early hockey memories. It’s probably the best outdoor sheet of ice in Southern California because it’s probably the only one. Growing up on a farm in Viking, Alberta, head coach Darryl Sutter and his six brothers would trek through the snow to play into the night, waiting for their mother to alert them that dinner was ready by either, "hollerin’ or chuck horns." "Dinner was at night and in Alberta, nights are usually clear and cold so we would play under the stars. I remember it vividly," Sutter said. "That walk there, you’d take your boots off, put your skates on in the snow and use your boots for nets. "And you didn’t have a lot of pucks so when the puck went missing in four or five feet (of snow) you’d find other people’s. If you got somebody’s puck, we were lucky enough to get Kelly Hrudey’s puck, you’d see a KH in there. With seven boys, you always have someone else’s puck."